The women’s soccer team will advance to the third round of the east region bracket of the NCAA Division II Tournament after defeating Franklin Pierce University on Sunday, Nov. 10. The Pioneers prevailed with a score of 3-1. Leading the way for the Pioneers were junior Julia Duffey with two goals, and freshman Terese Markelund with one goal. The team will travel to Bridgeport, Connecticut on Friday, Nov. 15 to face off against the University of Bridgeport in the next round. The time is TBD. Senior goalkeeper Hillevi Eklow earned her second ECC Goalkeeper of the year honor, and eight women’s soccer players earned All-ECC recognition on Monday, Nov. 5. Joining Eklow on the first team was junior midfielder Gabrielle Clark. Junior forward Julia Duffey, sophomores Erin O’Connor and Samantha Gordon, and senior Alice Schonfeldt earned second team accolades. Freshmen Kendra Oldroyd and Terese Markelund were named to the third team. 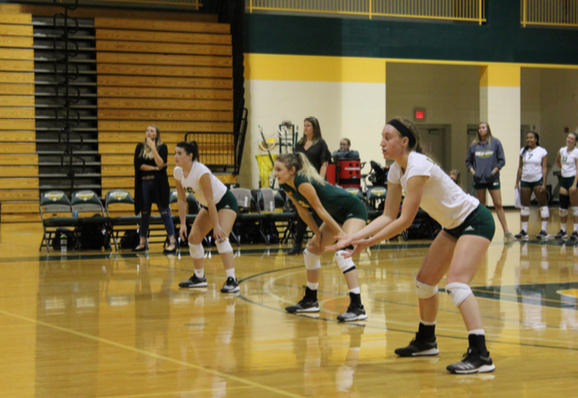 The women’s volleyball team played their first match of the ECC tournament on Friday, Nov. 9 in Amherst, N.Y. The Pioneers came back after being down two sets, but fell short of the comeback, losing to the Molloy College Lions, 3 sets to 2. Four student athletes from the women’s volleyball team were given recognition from the conference on Friday, Nov. 9. Senior Rachel Londot was named first team honoree for the second straight year, sophomore Lauren Kloos was named second team, while junior Kassie Agouti-Tejedor and junior Abby Eckhardt were named third team. The field hockey team finished off their regular season on Friday, Nov. 9, with a 7-1 victory against the American International College. The Pioneers finish the season 13-4 overall and 12-3 in the Northeast 10 (NE10) conference. The Pioneers finished third in the NE10. They play against the Stonehill College Skyhawks in the first round of the NE10 championship on Thursday, Nov. 13 at 1 p.m. The women’s basketball team began their 2018-19 season on Saturday, Nov. 10 and Sunday, Nov. 11, as they played in the East Coast Conference/Northeast 10 challenge. The tournament took place at Adelphi University in Garden City. The Pioneers took home two wins as they defeated the Pace University, 53-45, and Adelphi University, 85-73. They play against the Cougars of Caldwell University on Thursday, Nov. 15 at 5 p.m. at the Pratt Recreation Center. Saturday, Nov 10. Freshman Paul Hein netted the game winning goal with a header late in the match. The team will play against Adelphi University on Thursday, Nov. 15 at 1 p.m. Eight players on the men’s soccer team earned recognition of conference teams and major award winners on Monday, Nov. 5. Lukas Ostermann was named Offensive Player of the Year and was selected for the first all-conference team. Joining Ostermann as honorees were freshman midfielder Javier Rehberger Martin and freshman defender Paul Hein. Senior midfielder Vitorrio Argeri, junior midfielder Yohance Alexander, junior defender Kyle Parish and senior goalkeeper Oliver Hessner Hansen earned second team recognition. Sophomore midfielder Tom Stenberg earned third team.